Eagle Preserve Raft Trip. This raft trip floats through the heart of the Chilkat Bald Eagle Preserve. Our rafts are non-motorized and ideal for wildlife viewing. Our guides do all of the rowing so you can watch for animals including bald eagles, moose, bears, wolves and wild Alaskan salmon. The 48,000-acre preserve was established in 1982 to protect resident bald eagles and their critical habitat. These river lowlands provide abundant spawning salmon and nesting trees to one of the largest concentrations of bald eagles in the world. The best way to see eagles is by rafting quietly down a salmon-filled river with an experienced guide. The number of eagle sightings per trip varies with the seasons and ranges from as few as six in early spring and over 100 in early fall. 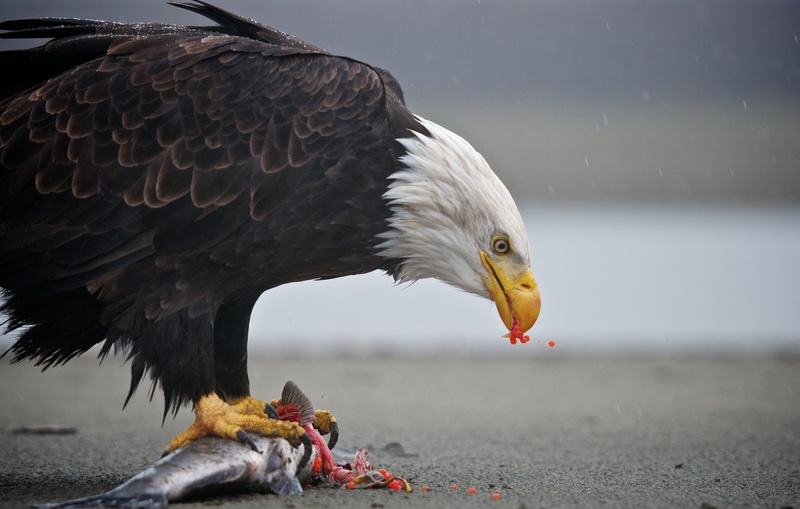 In the winter months, when fish runs are ending elsewhere, upwards of 3000 thousand bald eagles will congregate in the Chilkat Valley to feed on our late run of salmon. This is not a whitewater trip. Cameras and binoculars are welcome. Price includes door to door shuttle service, river boots, rain gear, lifejackets, and a hearty snack of locally caught smoked salmon and hot drinks. For flight reservations call Alaska Seaplanes at 907-789-3331 or visit them online at flyalaskaseaplanes.com. For ferry reservations call the Haines, Skagway Fast Ferry at 907 766 2100 or go to hainesskagwayfastferrycom. For Juneau ferries call 800-642-0066 or visit www.dot.state.ak.us/amhs. 1 to 3 day Upper Tsirku Fly & Raft Trip. The Tsirku River is flanked by Glacier Bay National Park to the west and the Coast Mountain Range to the east. To the north lies the Tatshenshini – Alsek Provincial Park and the largest contiguous protected land area on earth. These epic mountain ranges and their glacial valleys provide a scenic backdrop like no other. This trip starts in an Alaskan bush plane flying over ancient glaciers full of jagged crevasses and emerald pools. Your flight follows these rivers of ice as they descend into the valley below where you will land on a gravel bar next to the Tsirku River. This trip can be done in a day or up to 3 days depending on how deep you want to go. There can be some whitewater on this trip and the water is cold, participants should be in relatively good physical condition. Previous rafting experience is not required. Prices include river boots, rain gear, lifejackets, hearty meals and camping equipment. The Tatshenshini is a true wilderness river where people are seldom encountered and the feeling of nature around you is profound. The river supports a giant diversity of plants and animals and wildlife sightings and signs are frequent. This is one of the best river trips in North America and there has never been a more important time to see it. From the dry interior mountains of northern British Columbia to the lush coastal valleys of southeast Alaska, the Tatshenshini River brings you face to face with an intact ecosystem on the move. Sign up today for this once in a lifetime experience. The Alsek River is one of the largest drainages on the west coast of the Americas. 174 miles in length the Alsek descends from the Yukon high country and crosses the world’s largest non-polar ice sheet before reaching Glacier Bay National Park and the Pacific Ocean. From its humble beginnings in the Canadian tundra to the grand finale at Alsek Lake, this river trip will blow your mind. The rafting begins in Kluane National Park which boasts the densest population of grizzly bears in Canada. Although rarely encountered in camp these bears are often seen from the river along with a host of other wildlife such as moose, dall’s sheep, mountain goats and bald eagles. The weather is always a factor in this part of the world and that can mean any kind of conditions. You might find yourself living in your raingear full time or wishing you had packed more sunscreen. Either situation has its charms. Rainy and stormy makes it feel like you are boating in the Pleistocene and the long sunny warm days of the Yukon, BC, and Alaska can’t be equaled on this hemisphere. There are some exciting class III rapids to navigate and a short but thrilling helicopter portage over Turnback Canyon. This is an active trip that requires participation from clients and guides alike. There will be some early mornings, some long hikes and lots of carrying. Participants should be in good physical and mental health. Even in these wild conditions, the camping is comfortable, the food is delicious and the guides can’t be beat. Haines Rafting Company provides you with outfitter grade gear including tents, sleeping bags, and pads. Heavy-duty rubber rain gear, drysuits and rubber boots are also available for no extra charge.